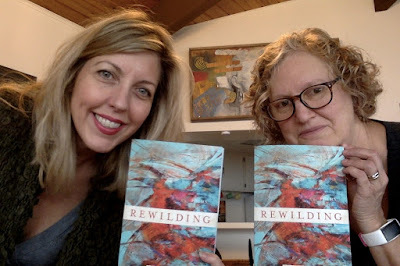 On Wednesday, my friend Ronda Broach came over to write poems with me. She got her at 3ish, we put out snacks and started writing poems (from openings of lines, from prompts, from word lists, etc.). By midnight, we had written about 14 poems. She spent the night and the next morning, we woke up and wrote a few more poems. When all was said and done, I had about 17 new drafts. I know, it's a bit of a poetry marathon, but it's kind of my favorite way to write poems. And while we were writing, Ronda said, "Oh, I have a new favorite book to show you..." and I said, "Me too!" Then we both pulled out January Gill O'Neil's new book REWILDING (just out from CavanKerry Press). Januay is one of my very favorite poets writing today. I have every one of her books and have been a fan of her work since the wayback days--I actually met her through the blog community. Her poems always get my attention, but this book is really some of the best poetry I've read. It's immediate. It smart, strong, it breaks your heart while you are falling in love with this. For me, these poems remind me what is means to be alive--they deal with loss (from divorce to death), fear, beauty, love of family, love of life, and how absolutely complicated this world is and life can be. They are not afraid to deal with any topic or subject, and this book is award-winning--in fact, if this book doesn't win some award, there is something really wrong in the world because I am one of the pickiest poetry readers around, and this book hits me hard and in all the right ways, and I know how strong it is. I am not going to say too much about the narrative that runs through this book because the poems are so good, I do not not want to spoil the magic I felt reading them one at a time, in order, in yes, one sitting. But if you haven't picked it up, please do. You will not be disappointed. I don't think I properly thanked you for the review. Loved it. Thank you!